Two power lines providing electricity to the Gaza Strip were disconnected overnight Tuesday further fueling an ongoing energy crisis in the beleaguered coastal enclave. Gaza’s energy authority said that the Jabalia line feeding northern Gaza off the Israeli electricity grid had failed due to a technical issue. For four days, the main power line from Egypt’s electrical grid, which provides a total of 28 MW, has also been down. Sources inside Gaza’s energy authority said Wednesday that the total supply of energy was now covering only 30 percent of the population’s minimum needs. Even at full capacity, the Egyptian and Israeli electricity grids, together with Gaza’s sole power plant, fail to cover the territory’s energy needs. They provide only 230 MW of electricity, while Gaza-based think tank Pal-Think has estimated Gaza’s needs to fall between 350 and 450 MW. In recent days, Gaza’s power station has also been struggling to maintain its output due to both fuel shortages and lack of funds. The coastal enclave has seen a series of large demonstrations protesting the energy crisis, with Gazans calling for the resignation of Palestinian Authority Prime Minister Rami Hamdallah’s government. Gaza’s energy authority has blamed the power plant’s low output on taxes imposed by the PA’s petroleum authority. 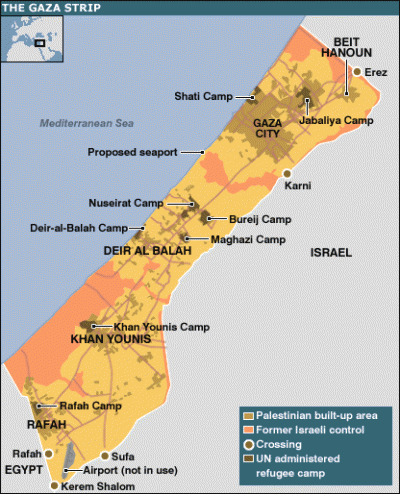 However, Israel’s crippling blockade has also severely limited fuel imports into the coastal enclave. War has also had taken its toll, and during Israel’s 50-day offensive on Gaza last summer, the power plant was targeted completely knocking it out of commission. Earlier this month, the UN warned that that the Gaza Strip could become uninhabitable for residents within just five years, pointing to the devastation of war and nearly a decade of Israel’s blockade. “The social, health and security-related ramifications of the high population density and overcrowding are among the factors that may render Gaza unlivable by 2020,” the UN Conference on Trade and Development (UNCTAD) wrote in its annual report.